Johnny Depp is a badass. Here are some of the greatest things he’s ever done (off-screen). Some of these Johnny Depp stories are hard to believe but most have indisputable proof; they are all amazing and sound exactly like the kind of awesome thing the most lavish, eccentric celebrities (that we actually like) would do. From surprising a little girl at her school, to stopping a mugging with a single look, to saving a horse he rode in a movie, here are the greatest (true) Johnny Depp stories. This is why Johnny Depp isn’t just an actor, celebrity or multi-millionaire, but a freakin’ movie star. Since he was in the area filming Pirates of the Caribbean 4, he decided to visit the school while still in full costume. Without warning to the school, the kids or the teachers, Depp arrived at her school in full Jack Sparrow character and dress. Everyone was surprised, and no one had any idea why he was there – except for Beatrice. Depp asked for Beatrice and when she came forth, he whispered to her: “Maybe we shouldn’t mutiny today ‘cos there are police outside monitoring me.” He gave Beatrice a hug, joked with the whole classroom about eating lots of candy and not brushing their teeth, never breaking character, and asked for a big round of applause for Beatrice. He then strutted out of the room and back into their imaginations. Also check out College Humor’s mash-up of two of Johnny’s crazier films. On May 2, 2010, a man approached Stephen Jones holding a bottle in his hand and demanded the British singer’s wallet. Depp just happened to be with Jones as the two had just finished a recording session together in Los Angeles. As soon as Depp saw the mugger, he stepped right in to his defense. Depp looked at the guy, using a stern gaze, and told him to back off. After a few seconds, when the mugger (who was using a broken bottle as a mugging weapon? really?) looked at Depp, he said, “I ain’t stealing from Captain Jack.” The thug put down his bottle and all was well. This is really the greatest and most epic part, though: Depp gave him a few bucks and sent him on his way. One of the most memorable names in 20th century pop culture, Hunter S. Thompson (famed author of Fear and Loathing in Las Vegas, creator of “Gonzo journalism,” drug addict, and all-around anti-authority badass) had a lot of friends in his later years (John Cusack, Bill Murray, Gary Busey, John Kerry, William F. Buckley, and more), but when it came to his death, few were as giving and dedicated as Johnny Depp. Hunter S. Thompson, John Cusack and Johnny Depp riding in a convertible with a blow-up doll (like ya do). Thompson’s ashes were fired from a cannon atop a 153-foot (47 m) tower of his own design (in the shape of a double-thumbed fist clutching a peyote button) to the tune of Norman Greenbaum’s “Spirit in the Sky” and Bob Dylan’s “Mr. Tambourine Man. Red, white, blue, and green fireworks were launched along with his ashes. Depp made sure everything was exact to Thompson’s specifications (which were pretty specific in his will). Somehow Johnny Depp always seems to commit the weirdest crimes. Even when the guy is doing something “wrong,” he does it with style. He’s never been arrested for doing anything outside of the realm of what you’d expect from him, even with all his money. In 1994, Depp was staying at a fancy New York hotel and completely wrecked his room. Like, furniture everywhere, broken glass, the works. 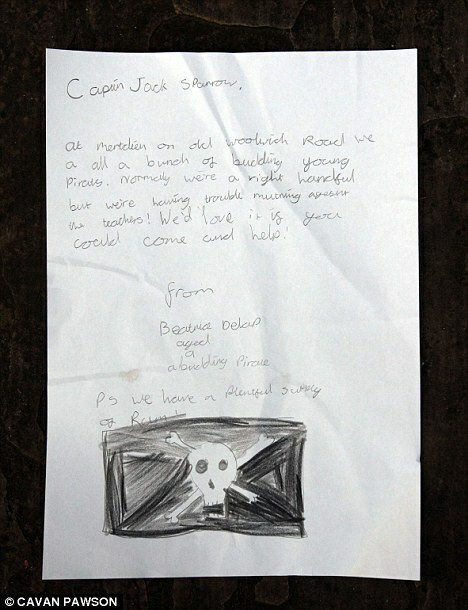 Roger Daltrey (lead singer of The Who) was staying in the room next door and complained of the noise Depp was making. When police arrived at the scene, there was a smashed glass coffee-table and other destroyed, mangled furniture in the $1200-a-night suite. Depp, however, claimed that an armadillo leapt out of his closet and had done the damage. Yes, an armadillo. The alleged creature was never found. Not surprising since armadillos are rarely found in New York, and even less likely in a luxury hotel’s closet, making Depp’s claim of innocence that much more awesome. Johnny Depp’s cavalier attitude about his brushes with the law and incarceration make him even more awesome. The other crime Depp was caught committing is just as unexpected, and pretty damn awesome (not including that paparazzi brawl he had, because really, who could stand those people). A security guard caught him vandalizing a 21 Jump Street billboard and was about to report him until he saw that it was the actor himself, defacing his own, well, face. Depp apparently didn’t agree with the message that the billboard, featuring his own image, was communicating to children. The billboard featured Depp holding a gun with the slogan, “Other Kids Pack Lunch,” underneath it. He saw that and didn’t like it, so he and his buddy decided to paint over it with some brushes and rollers. They ended up painting over the gun and turning Johnny into Groucho Marx. When the guard recognized who Depp was–and whose face Depp was painting on–he told him to hurry up and finish and left Depp and his friend alone. So hey, if you ever do something for the guy, he remembers it. Further proving his commitment to his loved ones, Depp donated the fee he earned for The Imaginarium of Doctor Parnassus to Heath Ledger’s daughter, after his untimely death. After hearing Depp’s idea, Jude Law and Colin Farrell did the same. A lot of actors think they’re God’s gift to the world and the absolute star of the show, but Johnny Depp knows that it takes a whole crew to make a good movie. So when Depp rolls in style, the whole film crew rolls in style. On a rainy day on the set of his latest film Pirates of the Caribbean: On Stranger Tides, Johnny Depp reportedly spent about $64,200 on warm jackets for all 500 of the crew members. True, that ain’t a whole lot of money – considering the fact that he owns an island and a $13 million estate in Italy – but it’s still a grand gesture and awesome thing to do. The guy is classy to say the least. Depp has also been very public about his love affair with wine, even sporting his famous tattoo “Wino Forever” (although it once said “Winona Forever” when the actor was dating the cute, thieving fellow celebrity Winona Ryder). He is so enthusiastic for good wine, in fact, that he even flies crates of them to wherever he’s filming for himself, the cast, and the entire film crew. He did this on the set of Public Enemies where he had ten crates of his homegrown wine (Yes, Johnny Depp even owns his own vineyard) flown in from France to keep him and the rest of the crew going. That’s 4,147 sky miles for a never-ending pour of wine. The West Memphis Three, Damien Echols, 19, Jason Baldwin, 16, and Jessie Misskelley, 17, were three teenagers who were wrongfully convicted of the murders of three eight-year-old boys who were found in a drainage ditch mutilated and beaten to death in 1993. It was believed that the teenagers were performing a Satanic ritual. Echols was sentenced to death, and Baldwin and Misskelley were sentenced to life in prison. “If there was the tiniest sliver of doubt [of their innocence], I wouldn’t be here,” said Johnny Depp after being asked why he supported them and how he could be sure if they were innocent. Arkansas courts refuse to give the three a retrial, but Depp continues to publicly stand with them in their cause to be tried fairly. There is absolutely no physical evidence that ties the convicted three to the actual crime scene. After seeing a documentary, Depp became deeply intrigued and empathetic to the case of the three and continues to go out of his way to defend these innocent men that Arkansas courts refuse to try fairly at every chance he can. Most celebrities, especially Depp, have a lot going on every single day with promoting their films, and making shoot dates, as well as living their own lives, yet he continues to make efforts for causes he can directly impact, just like this one.